-- don't forget to Ask! This can often get you BIG discounts on Vacation Condo Rentals so we are putting it on both this "Discounted Travels for all Ages" page and our "Discount Travels for Ages 50+" page. You do NOT have to be a timeshare owner to take advantage of these often discounted vacation timeshare condo rentals! These are usually "unused" weeks that the individual Resort Time Share Owners have decided not to use that year and placed for rent at affordable rates by the Timeshare Resort Management Company. These Timeshare Resort Condo rentals are available for Vacation Rentals by the week and in some cases by the day. More often rentals are available down to 3 or 5-day periods within their usually Sat to Sat Timeshare "week." The largest discounts will be when you rent more days and you will usually get the "cheapest" Vacation Condo Rental Deals on week rentals within the Resorts Time Share "week" -- usually Sat to Sat but some Resorts have other check-in "week" periods. Resorts and individual Owners vary widely on their policies so you usually have to check out the Timeshare Resort's Web Site or call to find out their policies. Check out our individual Vacation Condo Rental pages for more Timeshare Rental Info, Resort "Reviews," and some direct Resort Info and picture Links. To Info on Oceanfront Vacation Condo Rentals in: Cocoa Beach Florida area - Central Oregon Coast (Newport - Lincoln City areas) - Virginia Beach area. -- For us, not as much for the towing insurance, tire changing, and locked-out-of-car services as for the great informative free TourBooks, Maps, and trip Planning map services plus Discounted Travels deals and other product and service Discounts! AAA members get travel discounts on most car rentals, lodging at many locations, and admission discounts at many attractions, nation wide. Just ask and show your card. -- with a Resort Tour "Price"
Often can get some really cheap Lodging Package Deals by doing Timeshare Promotion Getaway Vacations. My Wife and I have used them to add a couple of fun days at the beginning or end of a regular vacation at a time share exchange Resort. Getaway Vacation packages often include area Attraction or Theme Park Tickets - sometimes Restaurant Dining Certificates which are Gene's favorite! The big discounts are in exchange for your agreeing to do a 90-120 minute Timeshare Presentation and Resort Tour sometime during your stay to qualify for the special discounted price. For more Info, see our new Timeshare Vacation Promotions page - a categorized listing of Vacation Getaway Discounts & Package Deals -- even a couple of free timeshare vacation Getaways! Our cheap or almost " Free " Time Share Vacations page has more Info about how the Getaway Promotions and Resort Time Share Presentations and Tours work. Some great discounted travels possibilities are available from mini-Vacation Promotional Timeshare Getaways. Naturally Yours Passport Plus annual Pass - $55 - Good for parking and admission to all state parks. Benefits include a 10 percent discount on camping, all state park merchandise, equipment rentals, and shelter and amphitheater rentals. (may not apply to non-park operated concessions) Lifetime pass is $275. 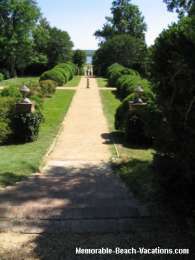 Several other Discounted Travels Park passes are described on this Virginia State Parks Web page. Check out the Multi-Agency (Forest Service, National Parks Service, Bureau of Land Management and the Oregon Parks and Recreation Department) day use Passport. Covers entry, vehicle parking and day use fees at all State and Federal fee sites along the entire Oregon Coast. - Annual vehicle passport for $35 or a 5-day vehicle passport for $10. (Note: the $35 Passport is on sale for $30 in December - Covers 12 month period.) More Info & where to buy - also other passes Information Link. Top 20 Getaway Vacation Destinations - the 20 most Popular mini-Vacation Getaway Destinations. Some great discounted travels Package Deals. Top 10 Worldwide Vacation Destinations! - Compare Rates, Ratings, Amenities, and Traveler User Reviews. The Vote is in on the most Popular places where Travelers are going! Can search from a variety of discounted Vacation Deals and Packages. Discounted Vacation Deals at Travelocity comprehensive Travel Site. Large easy to use Travel and Vacation Site. Can easily purchase everything for travel to and at family beach vacations here. East Coast Escapes: Hotels often from under $60 - Can quickly Compare Rates, Ratings, Amenities, and User Reviews. Also Florida Vacation Deals including Orlando, Disney World, and Cruises. Easy to purchase tickets and even pick seats online. Good place to compare car rental discounts and Car Rental Deals from several companies that offer discounted travels. Very large easy to use Travel and Vacation Site with helpful User Reviews of Hotels and Vacation Resorts + more. Can easily Compare Rates, Ratings, and User Reviews + discounted deals from several Vacation Travel companies. Another easy to use comprehensive Travel and Vacation Site. (You no longer have to use the "Bid" process at Priceline, but still great Vacation Travel deals!) - Save up to $500 on your Vacation Package at priceline! Many good discount travels deals in all categories on Priceline travel site. Can Compare airline reservation discounts with Travelocity above to see who has the best deal on your particular flight - often the rates are within $10. Another easy to use comprehensive Travel and Vacation Site. Top Vacation Package Deals at Expedia.com Also many good travel deals in all categories on Expedia travel site. Compare with Travelocity or Priceline above to see who has the best airline reservation discounts on your particular flight. Check out Discount Flight + Hotel Package Travel Deals - Save up to $525 when you book your flight and hotel together at Expedia.com! Be a little flexable on exactly when you fly and you can find some great Airfare, Car Rental, "last minure" and even specially negotiated Weekend Travel Deals at Hotwire. Sometimes can Fly for less on a major airline with Hotwire Hot-Fares(sm)! Timeshare Exchangers who belong to RCI (Resort Condomoniums International) can get car rental and Attraction travel discounts at many locations. RCI Timeshare Exchange Web site with member benefits and Resort listings - Can view pictures and Info an all RCI Resorts worldwide + Discount travels options - They even have "Cruise Exchanges" now. - RememberTip, Non-Timeshare owners can rent Timeshare weeks at many Timeshare resorts for very reasonable prices. II Timeshare Exchange Web Site - can view II Resorts worldwide and take "Visitor Tour." RCI above and II are the top two Timeshare Exhange networks with many resorts worldwide to exchange to. Need Discounts for a "Seasoned" Age 50+ or a Senior? Please send us any Virginia Beach Attraction Discounted Travels tips or good Virginia travel discount web sites which you have discovered that are not mentioned here. Send to us on our Your Top Picks & Comments Page. We appreciate your suggestions or comments Thanks! $ Attraction and Discounted Travels Tips - Includes Car Rentals - Discounts for All Ages - Cheap Vacation Beaches - This page.